The tutorial explains how to use multiple IF in Excel and provides a couple of nested If formula examples for most common tasks. If someone asks you what Excel function you use most often, what would your answer be? In most cases, it's the Excel IF function. A regular If formula that tests a single condition is very straightforward and easy to write. But what if your data requires more elaborate logical tests with multiple conditions? In this case, you can include several IF functions in one formula, and these multiple If statements are called Excel Nested IF. The biggest advantage of the nested If statement is that it allows you to check more than one condition and return different values depending on the results of those checks, all in a single formula. In modern versions of Excel 2016, Excel 2013, Excel 2010 and Excel 2007, you can nest up to 64 IF functions in one formula. 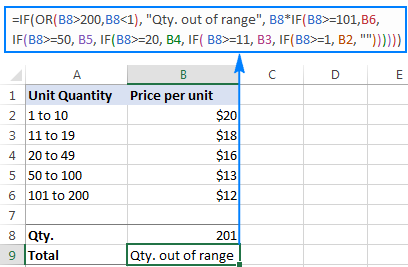 In Excel 2003 and lower, up to 7 nested IF functions can be used. Further on in this tutorial, you will find a couple of Excel nested If examples along with the detailed explanation of their syntax and logic. What the formula actually tells Excel to do is to evaluate the logical_test of the first IF function and, if the condition is met, return the value supplied in the value_if_true argument. If the condition of the 1st If function is not met, then test the 2nd If statement, and so on. This task can also be accomplished by using multiple IF functions. The logic is the same as in the above example, the only difference is that you multiply the specified quantity by the value returned by nested IFs (i.e. the corresponding price per unit). As you understand, this example demonstrates only the general approach, and you can easily customize this nested If function depending on your particular task. The nested IF formulas described above work in all versions of Excel 2016 -2000. In Excel 2016 that is part of Office 365 subscriptions, you can use the IFS function for the same purpose. Advanced Excel users that are familiar with array formulas, can use this formula that basically does the same thing as the nested IF function discussed above. Though the array formula is far more difficult to comprehend, let along to write, it has one indisputable advantage - you specify the range of cells containing your conditions rather than referencing each condition individually. This makes the formula more flexible, and if your users happen to change any of the existing conditions or add a new one, you will only have to update a single range reference in the formula. As you have just seen, there is no rocket science in using multiple IF in Excel. The following tips will help you improve your nested IF formulas and prevent common mistakes. In Excel 2016 - 2007, you can nest up to 64 IF functions. In older versions of Excel 2003 and lower, up to 7 nested IF functions can be used. However, the fact that you can nest a lot of IFs in one formula doesn't mean you should. Please keep in mind that each additional level makes your formula more difficult to understand and troubleshoot. If your formula has too many nested levels, you may want to optimize it by using one of these alternatives. 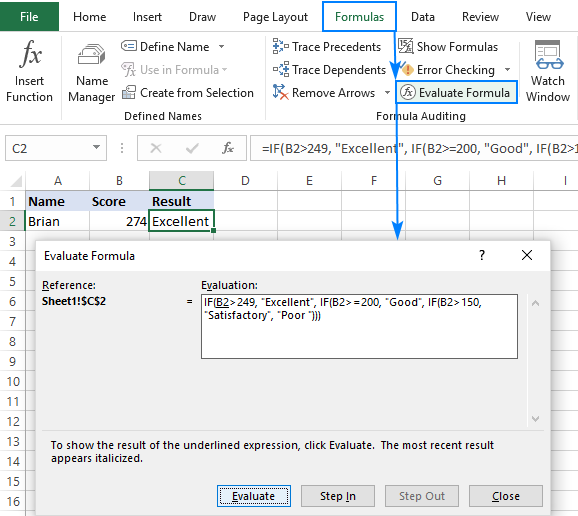 The Excel nested IF function evaluates the logical tests in the order they appear in the formula, and as soon as one of the conditions evaluates to TRUE, the subsequent conditions are not tested. In other words, the formula stops after the first TRUE result. The formula tests the first condition, and because 274 is greater than 150, the result of this logical test is also TRUE. Consequently, the formula returns "Satisfactory" without testing other conditions. To watch the logical flow of your nested IF formula step-by-step, use the Evaluate Formula feature located on the Formula tab, in the Formula Auditing group. The underlined expression is the part currently under evaluation, and clicking the Evaluate button will show you all the steps in the evaluation process. For example, the evaluation of the first logical test of the nested IF formula shown in the screenshot below will go as follows: B2>249; 274>249; TRUE; Excellent. If you have more than one set of parentheses, the parenthesis pairs are shaded in different colors so that the opening parenthesis matches the closing one. When you close a parenthesis, Excel briefly highlights the matching pair. The same bolding, or "flickering", effect is produced when you move through the formula by using the arrow keys. For more information, please see Match parenthesis pairs in Excel formulas. The logical test of the second formula will return FALSE even if the value in B2 is greater than 249. Why? Because 249 is a number and "249" is a numeric string, which are two different things. When building a formula with multiple nested IF levels, you can make the formula's logic clearer by separating different IF functions with spaces or line breaks. Excel doesn't care about extra spacing in a formula, so you may not worry about mangling it. To move a certain part of the formula to the next line, just click where you want to insert a line break, and press Alt + Enter. Then, expand the formula bar as much as needed and you will see that your nested IF formula has become much easier to understand. To get around the limit of seven nested IF functions in Excel 2003 and older versions and to make your formulas more compact and fast, consider using the following alternatives to nested Excel IF functions. To test multiple conditions and return different values based on the results of those tests, you can use the CHOOSE function instead of nested IFs. Build a reference table and a use VLOOKUP with approximate match as shown in this example: VLOOKUP instead of nested IF in Excel. Use IF with logical functions OR / AND, as demonstrated in the these examples. Use an array formula like shown in this example. Combine multiple IF statements by using the CONCATENATE function or the concatenate operator (&). A formula example can be found here. For experienced Excel users, the best alternative to using multiple nested IF functions might be creating a custom worksheet function using VBA. This is how you use an If formula in Excel with multiple conditions. To have a closer look and probably reverse engineer the formulas, you are welcome to download the sample Nested If Excel worksheet. I thank you for reading and hope to see you on our blog next week. 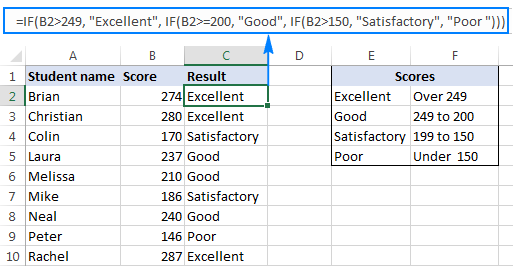 287 Responses to "Excel nested IF statement - multiple conditions in a single formula"
I have 2 sheets in excel, the first carrying the data and the second where the data will be placed. I am to compute the fuel consumption of the different types of equipment however there are types of equipment in the first sheet which has the same dates and have to be added together in a single cell in the 2nd sheet. Which formula should I use to compute it?